The retirement ceremony for Mongolian Sumo grand champion and 68th yokozuna Asashoryu was held at Ryogoku Kokugikan in Tokyo on October 3. Mongolian Prime Minister S.Batbold, thousand of fans and friends from Mongolia, Russia, Singapore, South Korea, USA and Taiwan bid farewell to the yokozuna, whose popularity still remains strong even after leaving the sport. Sumo wrestlers know the oicho or big-ginkgo hairstyle. 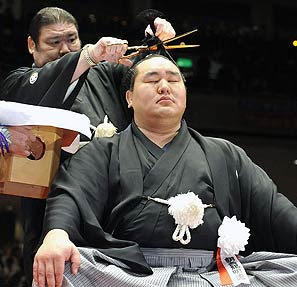 About 380 people took snips from his oicho (ginkgo-leafed topknot) before his former stablemaster Takasago cut it off. Read more about this hairstyle on the Usage-page of my website.